March 17 began like any other morning for Stephen Shipman, but soon took a delightful turn. The associate professor of mathematics was teaching his 11:30 a.m. Math of Resonance class when three unexpected guests arrived. Guillermo Ferreyra, College of Science interim dean; Robert Perlis, mathematics chair; and Terry Latiolais, former chair of the college’s Dean’s Circle Executive Committee, walked to the front of the class. Assuming the men needed to make an announcement, Shipman dutifully took a seat beside his students. Ferreyra offered words of praise about Shipman’s accomplishments and commitment to his students. All three men then presented the inaugural Dr. Marion “Soc” Socolofsky Award for Teaching Excellence to the surprised professor. Last year, the college’s Dean’s Circle Executive Committee established the Dr. Marion “Soc” Socolofsky Award for Teaching Excellence. It celebrates Socolofsky’s contributions to the college by recognizing members of the faculty who have shown an exemplary commitment to academic excellence through teaching and mentorship. Students and faculty members submit nominations that are reviewed by the committee, which chooses recipients. The award honors the legacy of the late Socolofsky, who was a fierce advocate for students and one of the college’s most influential leaders and educators. Throughout Socolofsky’s 36 years at LSU, he served as head of microbiology for 20 years; taught more than 12,000 students; advised more than 250 master’s and PhD students; and was a member of the Dean’s Circle. Shipman received a plaque and a monetary award in recognition of his exemplary teaching and commitment to student mentoring and engagement. 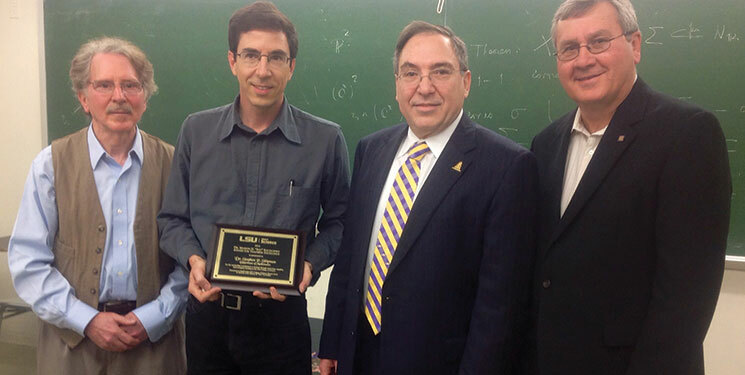 He shared that the award itself represents the importance of a professor’s role in students’ lives.